In this section of the site, we provide images of maps that are useful for placing the documents, churches and archives that come together in this project within a historical context. These maps give perspective into how the mapmakers conceived of their world, as well as how borders and regions have changed over time. Not all of the maps included here are from archives that participate in the ESSSS project. For maps included in other digital archives, click on the map to access the database from which you can download a high quality copy. Reference information is included beneath each map. New chart of the seas surrounding the island of Cuba...and a map of the island itself, 1762. Part of the Williams Ethnological Collection, John J. Burns Library, Boston College. Public domain image available via Boston Public Library Online Photostream Collection. Map of West Indian Islands Discovered by Columbus (includes Cuba) from The Earth and its Inhabitants. The European section of the Universal Geography by E. Reclus. Edited by E. G. Ravenstein. Illustrated by ... engravings and maps", "Nouvelle Géographie universelle. La terre et les hommes." From the British Library Online Flickr Photostream Collection. 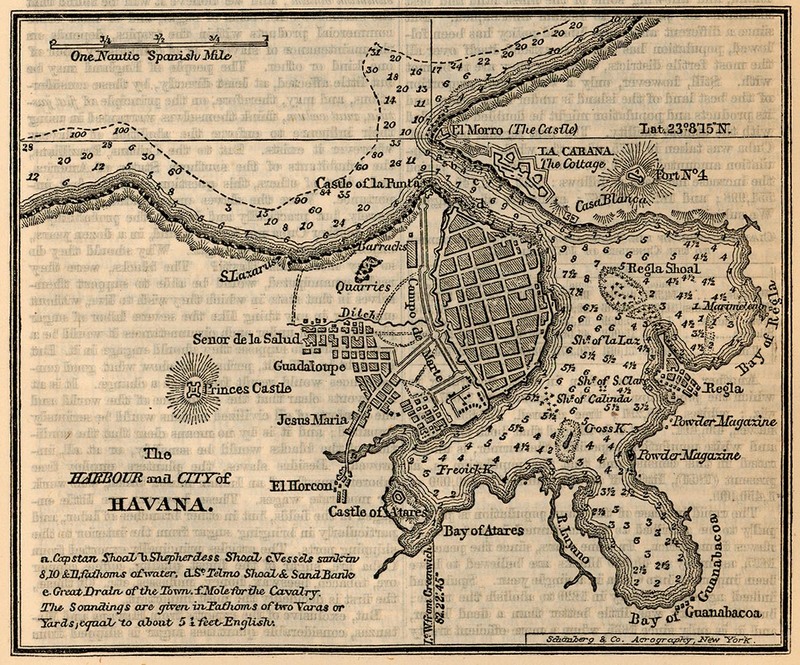 "The Harbour and City of Havana" from A Cyclopedia of Commerce and Commercial Cavigation by I. Smith (Isaac Smith) Homans, 1858. From the Perry-Castaneda Library Map Collection of the University of Texas, Austin. "Map of Cuba," 1898 from The American War with Spain: a complete history of the war of 1898 ... With maps and illustrations by Charles Morris. From the British Library Online Flickr Photostream Collection. 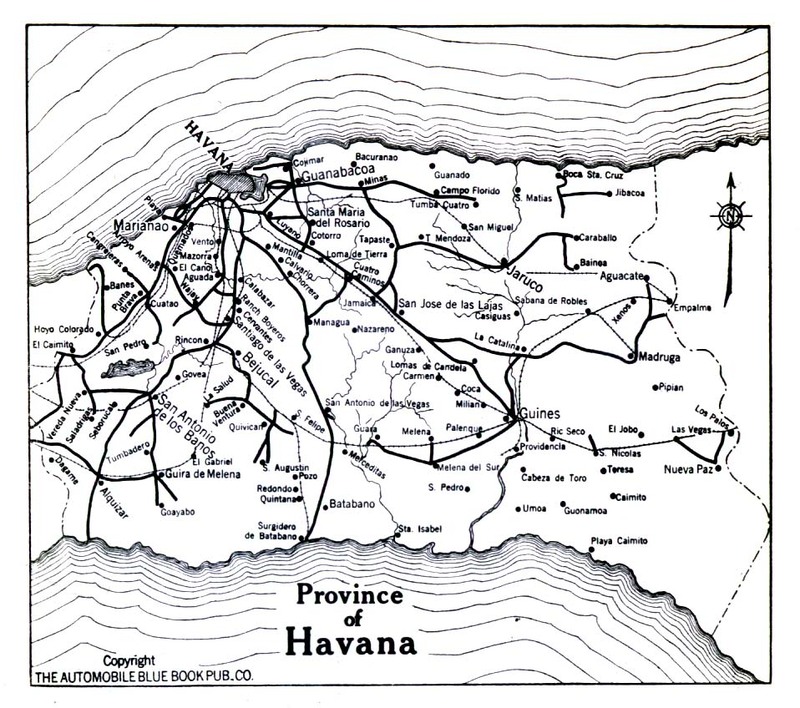 "Cuba, Province of Havana," 1919 from The Automobile Blue Book, Volume Six. Part of the Perry-Castaneda Library Map Collection of the University of Texas, Austin.